There is very little ice to be found in Iceland in summers, despite the name. (conversely, there is very little greenery – and a lot of ice – to be found on Greenland, all through the year). 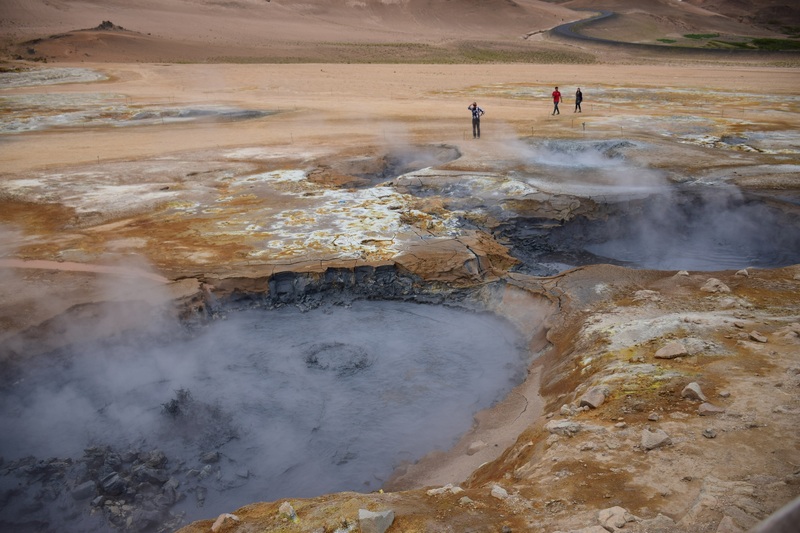 Instead, Iceland has a few active volcanoes, some boiling-water-spewing geysers, scalding steam vents and innumerable hot springs. 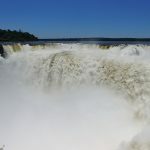 It also has eye-popping number of waterfalls, very picturesque lakes, some very large glaciers and extensive mountains. 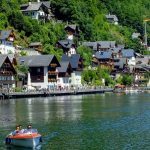 And if that weren’t enough variety, it has vast green meadows (some overrun by lilac-coloured lupin flowers), lakes filled with icebergs, extensive underground caves, and some exotic beaches. And there are no trees, by the way. If imagining all of these together in a small island seems bewildering, then you’ve begun to appreciate how magical it is to visit Iceland and see all these nature’s wonders for yourself. And this is just Iceland in summer, without any ice caves or Northern Lights. Iceland is sparsely populated, especially outside of the capital city of Reykjavik, which is both a good thing and bad. Most of the countryside feels untouched by humans, save the odd farm with fencing around it. 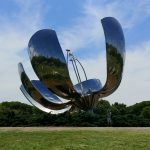 There is no public transport to speak of, so self drive – or a tour bus – are the only ways of seeing the country. We drove on Iceland’s Ring Road/Route 1 over 12 days in June, making a full circle of the country – and covering most of highlights of Iceland. We skipped the wild and rugged central Highlands, which require serious 4X4 machinery. It takes 10-12 days to properly do a circuit of Iceland. It is possible to do it in 7 days in a cinch, but that would mean missing out on a few attractions – and driving lot more hours per day. 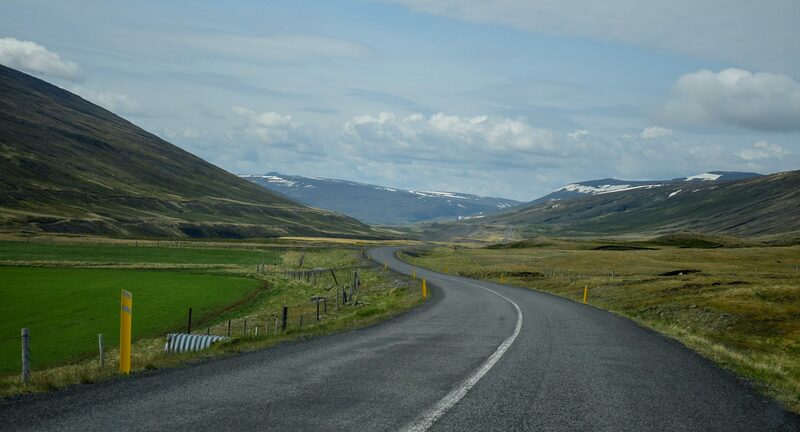 There is no specific direction – though most travelogs/guides cover Iceland in the anti-clockwise direction – probably because the Golden Circle is to the southeast of Reykjavik. The Ring Road itself is an all-weather road in excellent condition, and there is no traffic to speak of, so driving isn’t much of a challenge. We were two couples on the trip – two sisters and their husbands. Thank you Archana/Mrinal for initiating the trip – and making it so memorable. 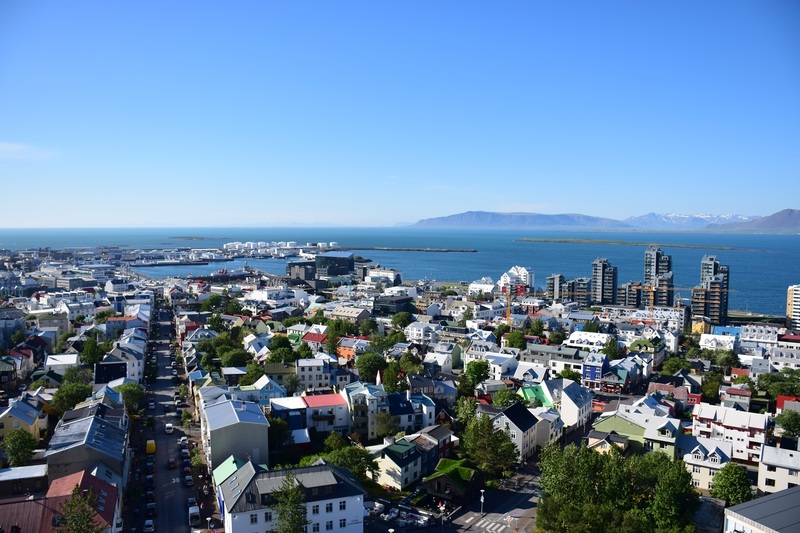 Unless your flight was really long, I’d suggest starting your trip immediately and push Reykjavik till the end of the trip – when Reykjavik’s urban comforts feel extra welcome. 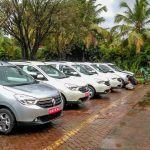 You can arrange your car rental to have your vehicle delivered at the airport itself, and unless you are really particular, you can manage refreshments/food at the airport (and save a day). The Golden Circle is a group of more famous natural wonders of Iceland, in a relatively small area. Its is also the last place where you will see a lot of tourists. 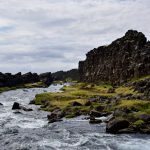 The Golden Circle includes Þingvellir (Thingvellir) National Park (visible fissure between European and American continental plates), the thundering Gullfoss Waterfall, Strokkur geysers, geothermal vents in Seltún and the beautiful Kerið Crater. 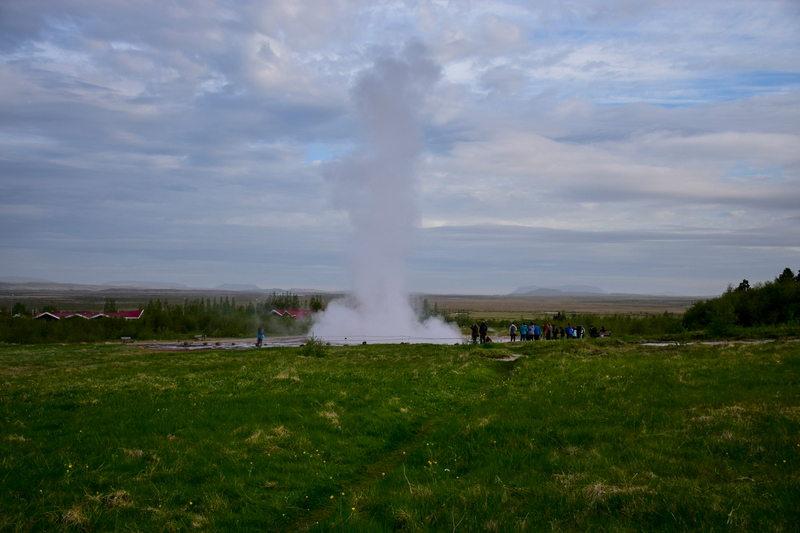 We covered Seltún (geothermal area), Kerið Crater, Strokkur geyser and Gullfoss waterfall on day 1 and Thingvellir National Park on day 2. We stayed the night at an Airbnb cottage near Selfoss. A detailed write up on Golden Circle is done in a separate post (here). 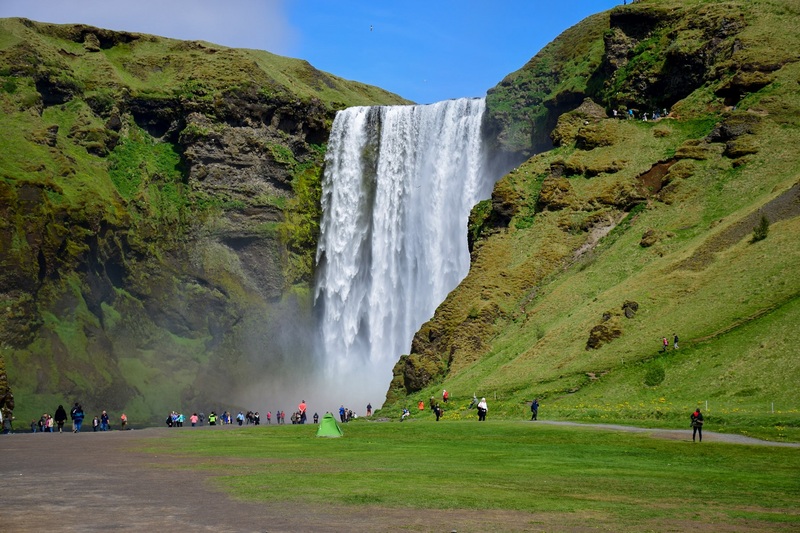 Skógafoss is a beautiful straight wall of water, where you can hike up all the way to the top. The spray always creates a rainbow on the waterfalls, making it one of the most photogenic spots in Iceland. Seljalandsfoss is a smaller waterfall, but it is one of the few waterfalls where we can go behind the cascade, which makes for some stunning photography (although saving your camera equipment from the mist is quite a challenge). Very close to Seljalandsfoss is a hidden waterfall called Gljúfurárbui (ignore the pronunciation, we never got the hang of it either). The waterfall is a bit challenging to get to, inside a narrow cleft in the rocks, but it is very unique and worth the hassle. The town of Vik is where most people stay, when they plan a glacier walk or a boat ride in Jökulsárlón glacier lagoon. We stopped for lunch in Vik and drove down to the Reynisfjara beach nearby. 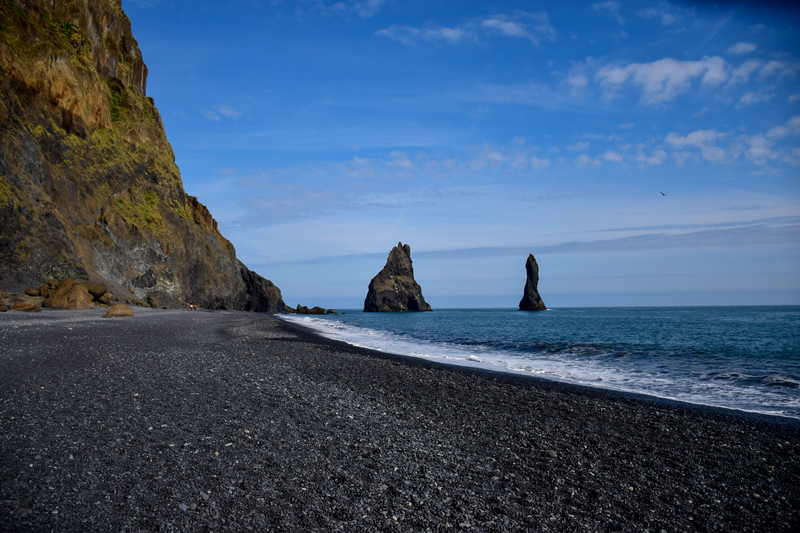 The beach is made of black volcanic sand, and is flanked by beautiful basalt columns – making it a very photogenic place. But even in summer, the ocean is very cold, so forget about getting your toes wet. We missed visiting the wrecked US Navy aeroplane, which is a popular attraction, because vehicular access to it has been stopped by the farmer whose land the aircraft sits on. You have to walk for 4 km (each way) to reach the plane now, and we just didnt have that much time to spare. 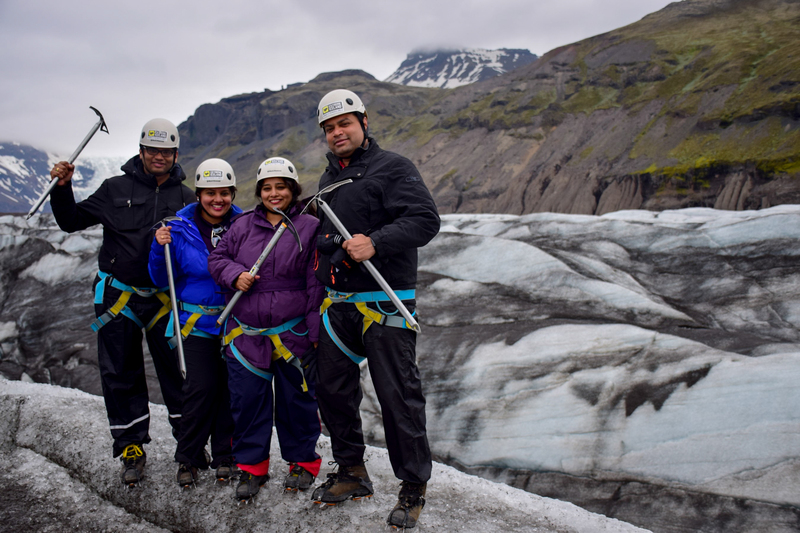 We hooked up some crampons and cold suits and took a small hike on the Svínafellsjökull glacier – with the help of the guys at Extreme Iceland (www.extremeiceland.is). We took the 3 hr beginner level course, since none of us had walked on a glacier before. And it turned out, we managed it without breaking a sweat. Glaciers are fascinating – huge rivers of ice flowing down a mountainside. 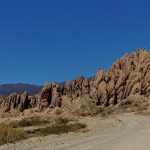 And they have their own complete ecosystem – mini valleys, hidden crevasses which can swallow up humans, tiny running streams of water and wondrous formations of ice. 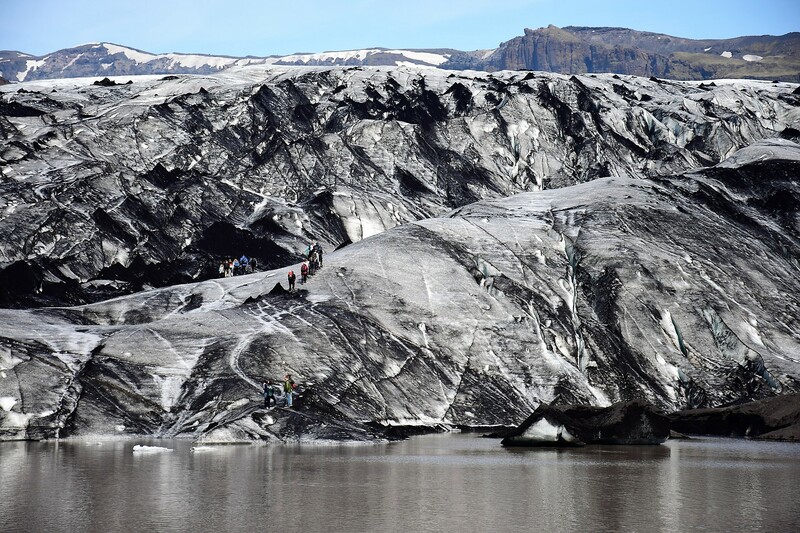 All glacier hikes start at Skaftafell, from where it is a small jaunt to the mouth of the glacier. 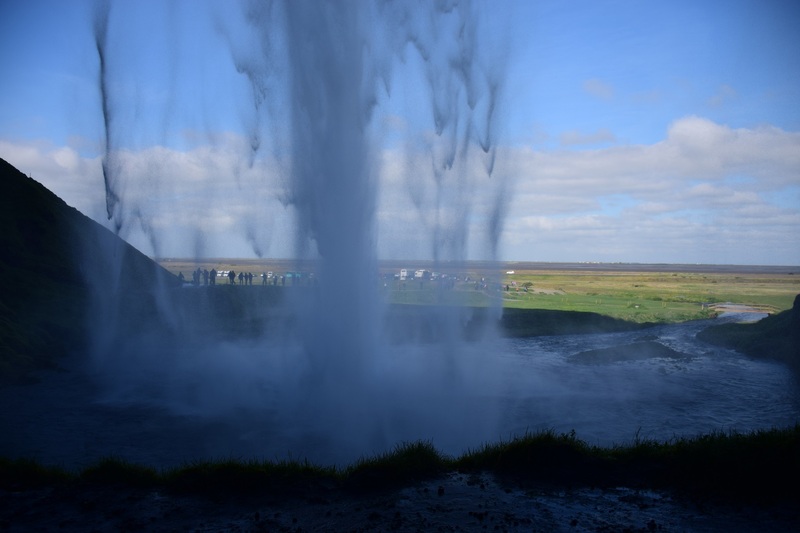 As with everything else in Iceland, the trip needs to be booked well in advance, especially in the popular tourist months. Day 5 was the longest drive of the trip. From Fjallsárlón, we drove to Stoksness Peninsula. 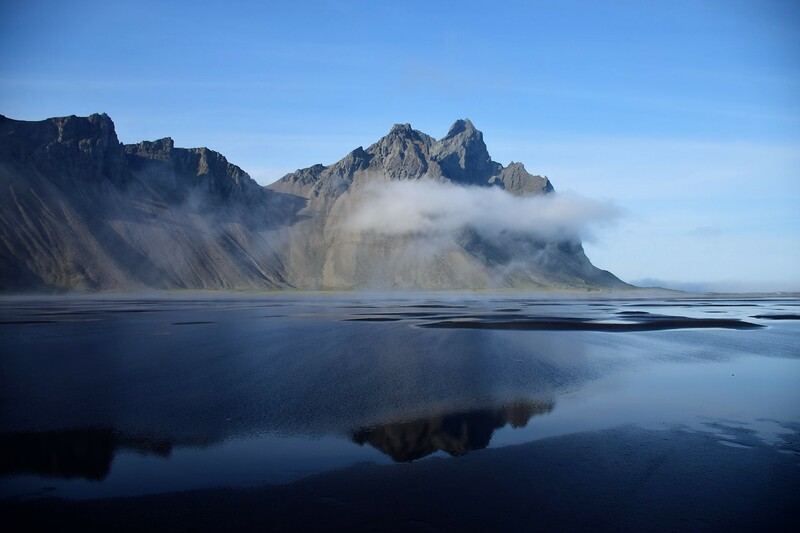 The solitary Mt Vestrahorn at the end of a shallow sea provides some fantastic photography options. From Stokkness to Egilsstaðir was a long drive through the wild Eastern Fjords. The scenery is stark, uninhabited and mad beautiful. 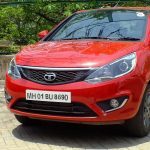 Driving can be a bit tricky though as there are some steep mountain roads, with the ocean on the other side. 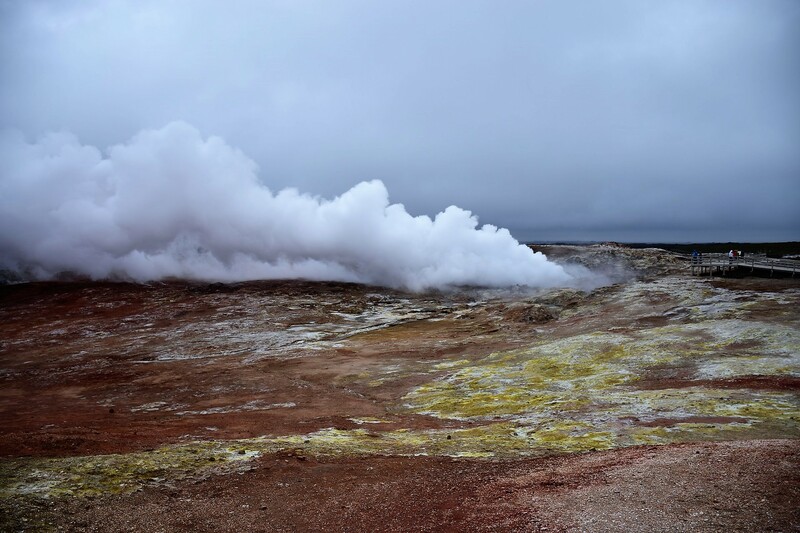 First stop was Námaskarð geothermal area (Hverir), a barren landscape interspersed with boiling mud pools, smoking steam vents and colorful deposits left behind by the hot waters. The safe walking areas are clearly marked with flags – and it is really unsafe to leave that path. Dettifoss is a huge waterfall, said to be Europe’s most powerful. We found we couldnt get to within 100 m of the falls without getting drenched by the mist. 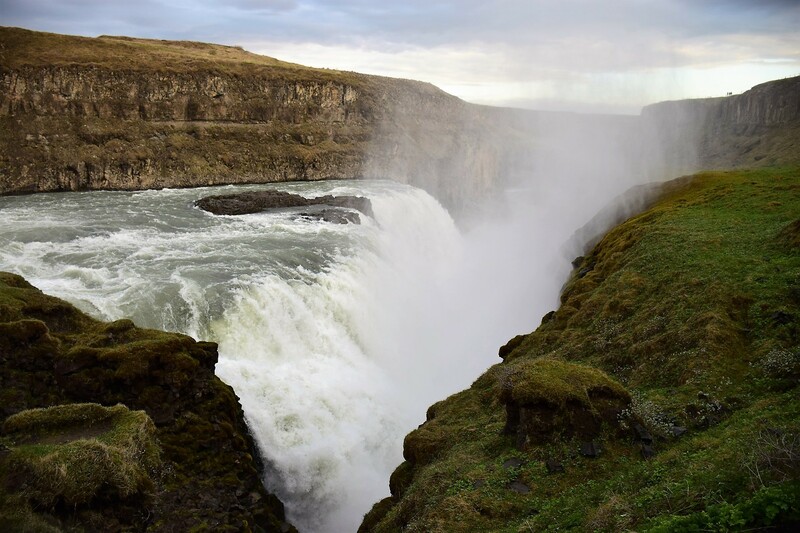 Selfoss is a smaller waterfall, but beautiful in its own way. Godafoss is the third notable waterfall in Myvatn region, and is similar to Selfoss. The Myvatn lake itself has a unique feature not seen anywhere else – Skútustaðagígar – which are pseudo craters around the lake, formed when lava flowed over wetlands, eventually resulting in steam eruptions. Closeby is Dimmuborgir lava field, where the black lava flows have formed fantastical giant pillars and arches naturally. Then there is Grjótagjá, a hot spring cave, which unfortunately has become a bit unstable. But my two personal favorites were Stora Viti and the Myvatn nature baths. 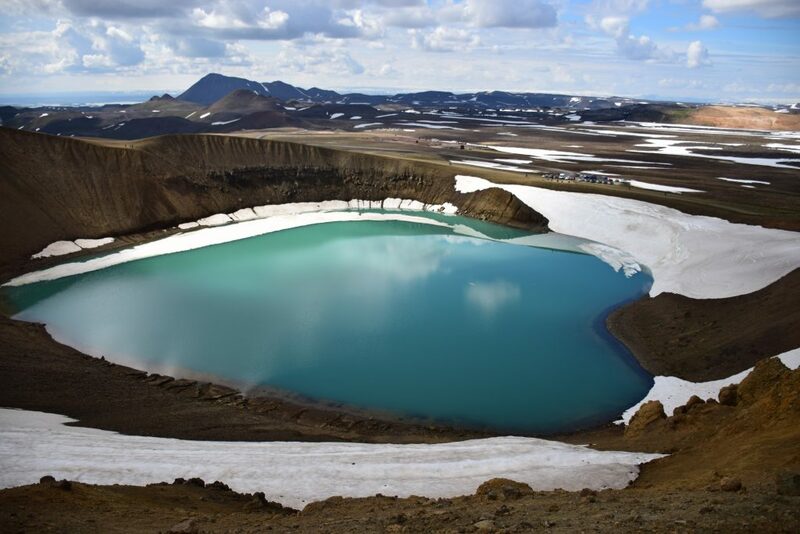 Stora Viti (above) is a crater lake, in a beautiful teal color. It takes 30 min to walk all around the crater, and gives phenomenal views. Close to the crater are steam vents and hot springs, meaning the area is still geothermally active. And after a long day of exploring the region, you HAVE to dip into Myvatn nature baths (https://www.myvatnnaturebaths.is/). 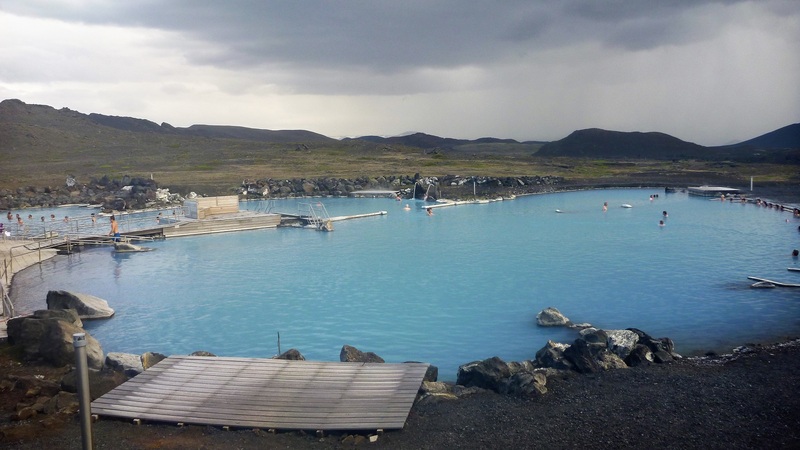 It is a geothermal pool, similar to the more famous Blue Lagoon near Reykjavik, but less crowded (and they allow you to carry beer and wine inside the pool). Your Iceland trip is incomplete without soaking up in one such hot pool. While there are whale watching tours out of Reykjavik, Húsavík is apparently the place in Iceland for viewing these giant creatures. There are 4-5 companies which offer whale tours, and there are multiple time slots. We took the tour with North Sailing (https://www.northsailing.is/) and we were lucky with very good weather – no fog or rain. It was unexpectedly cold in the sea, but thankfully insulating overalls are part of the package. 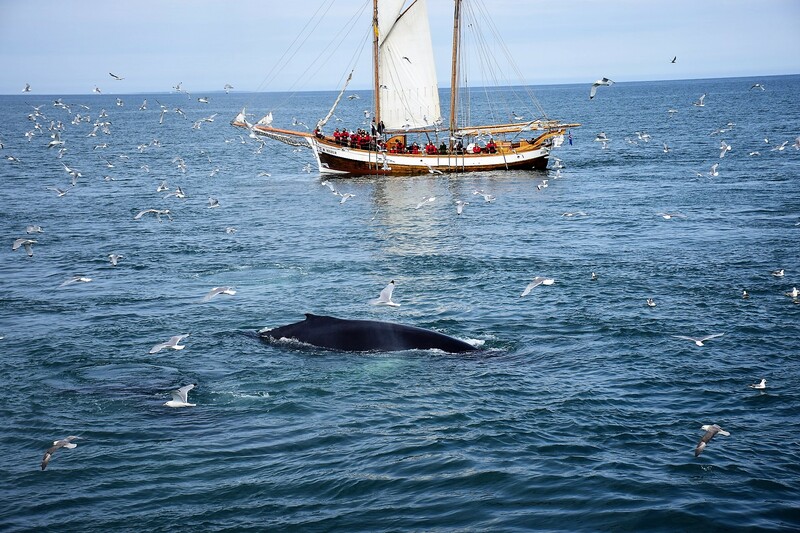 I guess it was our lucky day – we got to see pods of humpback and minke whales. It was a crazy spectacle – whales surfacing all around the boat – I was really hassled trying to take pictures of them all ! Akureyri is the second largest city in Iceland, but with a population of just 18,000 people, it is more town than city. For us, however, it was delightful, because it has an Indian curry house – it was pretty much the only reason we entered Akureyri! After Myvatn, the rest of northern Iceland doesnt have any big attraction, so it was a long drive for us to Snæfellsnes Peninsula in west Iceland. 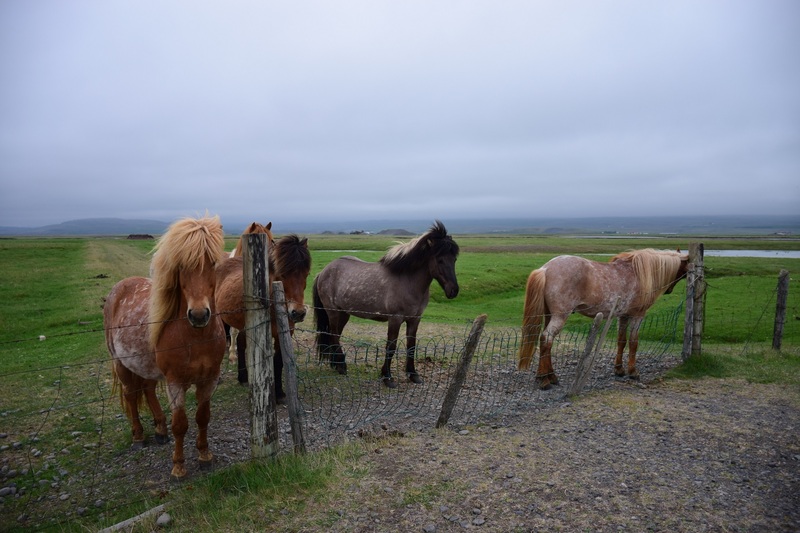 I will digress a bit and talk about Icelandic horses. At many places along the ring road, you can see farms with horses in it. Icelandic horses are a separate breed, with short build and long mane of hair. It gives them a very handsome, even funky look. The farm boundaries are very close to the road, and you can always see herds of horses inside. They are friendly animals and will always come up to the fence when approached. We saw a lot of horses on our drive from Akureyri to Blönduós. We had a long drive on Day 9 from Blönduós to Kirkjufell. 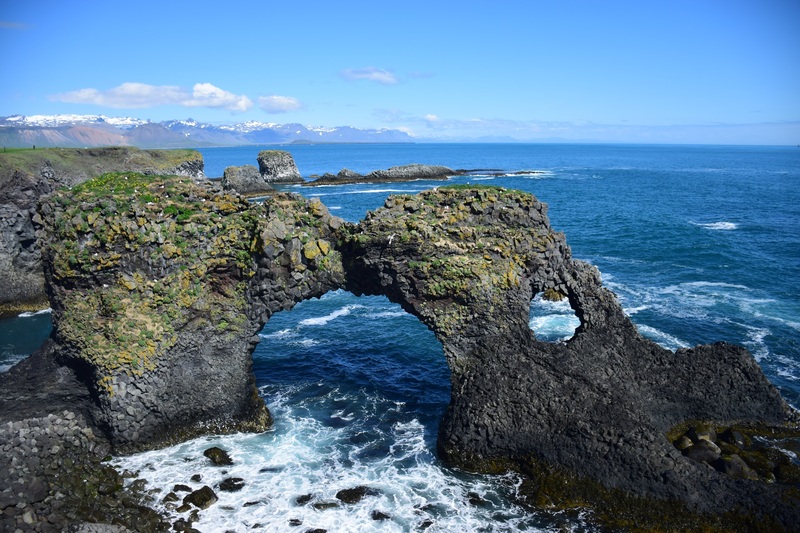 While the journey was beautiful, there aren’t any tourist attractions apart from Hvítserkur, which is a forlorn rock in the sea, in the shape of a crouching giant (as per local folklore). We were lucky enough to see some white furry seals at a random stop on the road. The location didnt have any name, we just stopped when we saw few other vehicles parked. 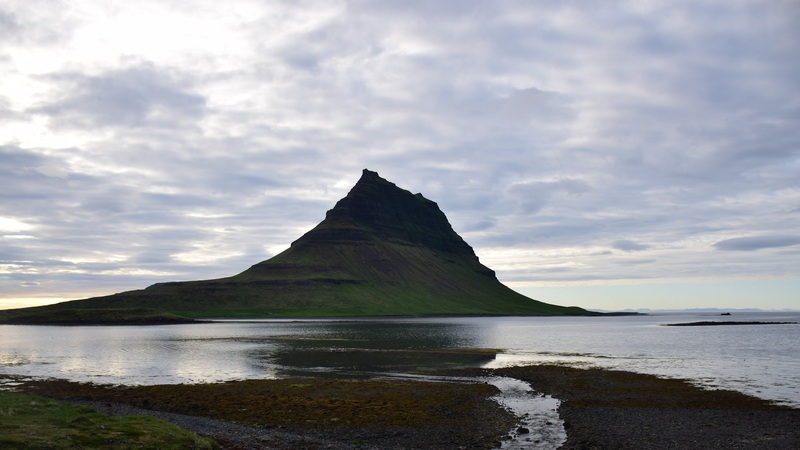 Our destination for the day was Kirkjufell mountain. The standalone mountain, with its namesake waterfalls, is one of the most photogenic places in Iceland. And if you are a Game of Thrones fan, you might have seen it in the S07E06 (Beyond the Wall) as the Arrowhead mountain. 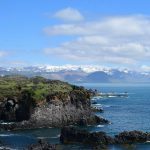 Snæfellsnes Peninsula is too big and details are mentioned in its own separate post (here). On Day 10, our first excursion was Vatnshellir cave, an 8,000 yrs old lava tube, which extends 35 m below the surface. We took a tour with Summit Guides (http://www.summitguides.is/) – and it was a very short, exciting (and freezing-cold) trip down into the ground. Hellnar is almost at the westernmost tip of the peninsula and used to be a small fishing village. But now it is known for a beautiful natural rock arch created by waves. There is another equally beautiful arch at Gatklettur a little distance away. Both sites are supremely photogenic, like pretty much the whole country. Snæfellsnes also has probably the only golden sand beach in Iceland, at Langaholt. 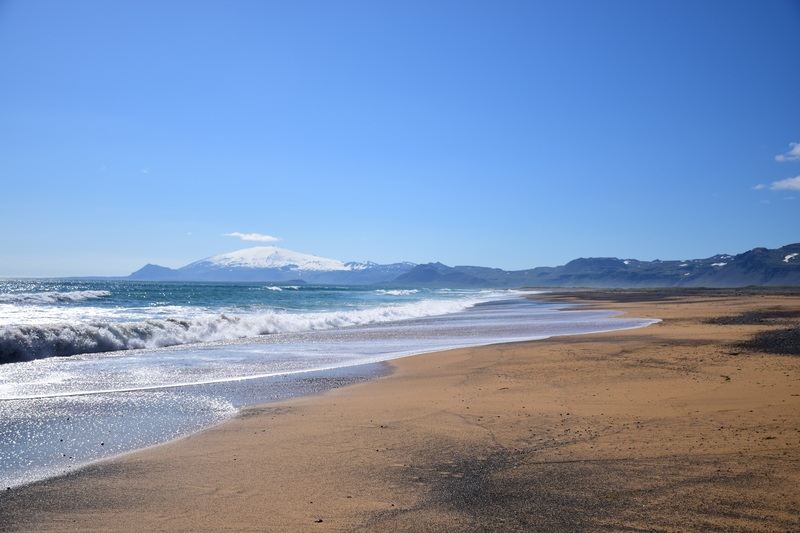 The beach is accessible only by walking through a marshy stretch, but it has a picturesque setting with Snæfellsjökull volcano in the background. The final stop of the day was at the basalt columns of Gerðuberg, where vertical columns of basalt give the impression of a fortified wall. Day 11, and our final stop in Snæfellsnes was the twin Hraunfoss and Barnafoss waterfalls. 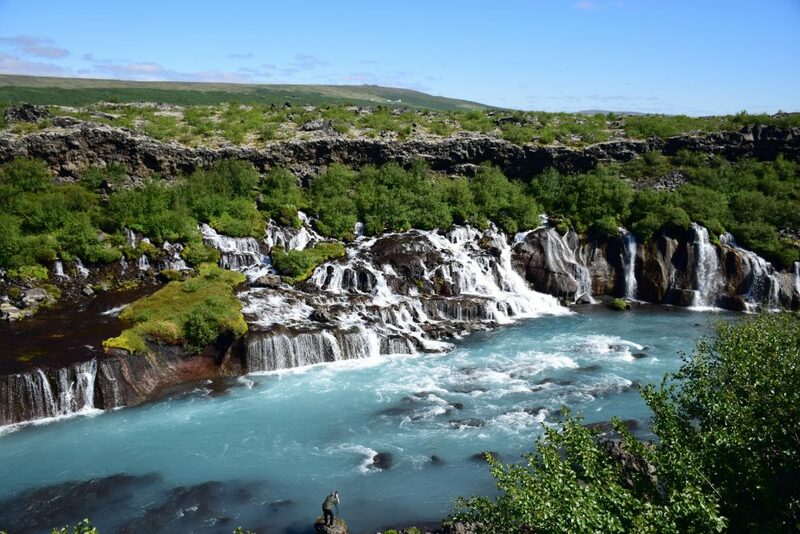 Even after seeing countless big and small waterfalls, Hraunfoss took our breath away. The waterfall seems to flow straight out from inside rocks. It isnt an illusion, the water is travelling through porous lava rocks below the ground, before falling off the cliff. The nearby Barnafoss is more of of a cascade rather than full waterfall. And so finished our long drive around Iceland as we drove back to Reykjavik. After being in wilderness for the last 11 days, Reykjavik feels delightfully urban. The city is very clean and green, with low population density. It doesnt have any highrises. The Hallgrímskirkja church is the tallest structure in the city. The church is has an interesting structure, with the bell tower integrated in the centre, although inside the church is very frugal and non-ornamental. But the church’s best feature is a (paid) elevator to the top of the church tower, where you can have fabulous panoramas of the city. Apart from Hallgrímskirkja, the other notable places to visit in Reykjavik is the Harpa – a modern concert hall and home of the Icelandic Symphonic Orchestra. There are regular shows during summer, if you are interested. Tjörnin (The Pond) is another pretty destination, a lake with the City Hall at one end and surrounded by gardens. We had an extra day in Iceland, kept as a backup extra day, and also because Lufthansa didnt have daily flights back to Bombay. 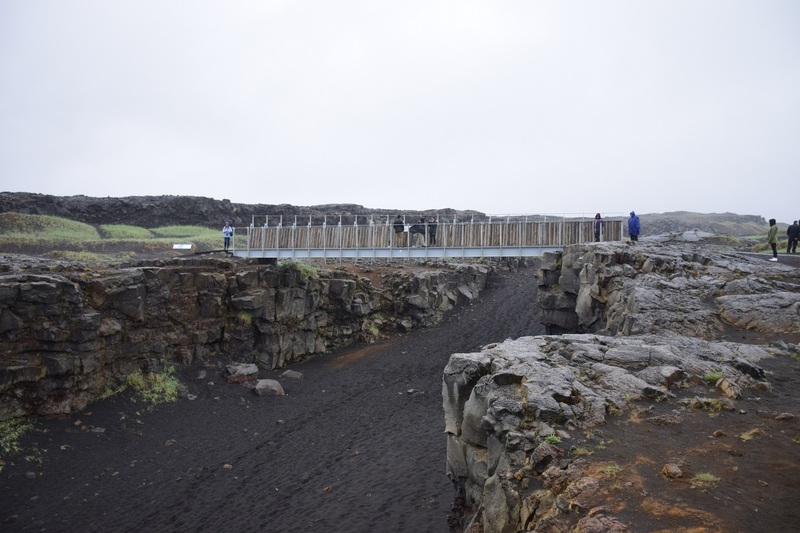 The other notable spot is the bridge built between the Eurasian and North American continental plates. The bridge is small and rather unremarkable, but the schism between the two sides gives you a lot to think about, including our place in this giant jigsaw that the world is. 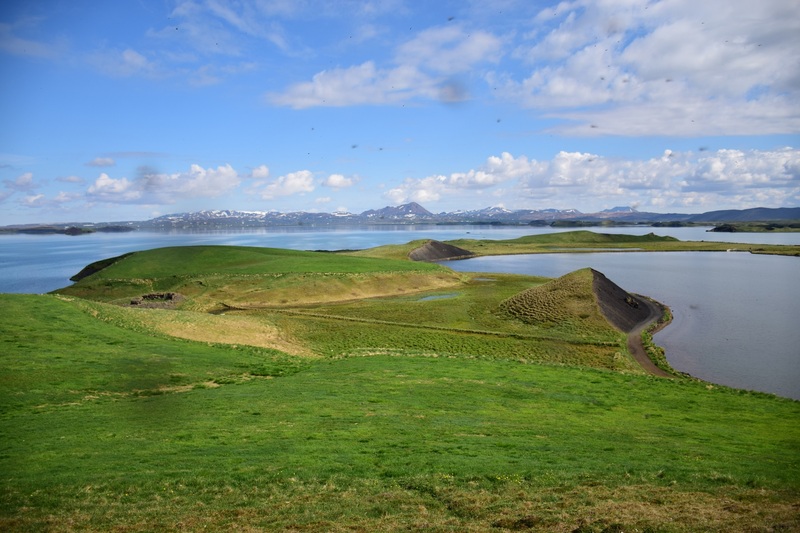 Note : these sites can be covered on the first day, when driving out of Reykjavik, and do not need a dedicated day. June-Sep is peak summer season. May and October are shoulder months, though some roads and places might be closed in May/Oct. 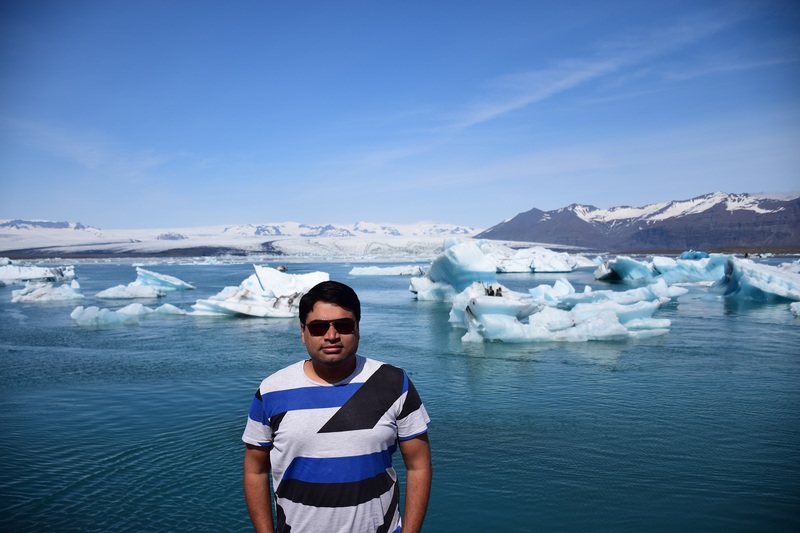 In Iceland, food and accommodation are both very expensive, esp if you are earning in INR. In hotels, like the Fosshotel chain in Iceland, rooms are a minimum of €200 a night, if not more. We stayed in Airbnb apartments for the entire trip, where the cost for accommodation for 4 of us was €100 per night. Similarly, we had sit-down dinner at restaurant only once in the entire trip. Most of the dinners were quick fix meals like ready-to-eat pasta, ramen etc from the supermarket. Outside of Reykjavik, accommodation is very limited and consequently gets sold out very quickly. We started looking for rooms for June trip in March, and we still could not find accommodation in Vik and we had to settle for Hofn. Tours like glacier lake boat trip, glacier walk also can get sold out very fast in summers. So try to book yours early if you can. A car is a must-have to be able to view Iceland at its best. A 4WD isnt necessary if you arent keen on going on F-roads (gravel country roads). We used a Ford Focus Wagon and didnt have any issues. The sun doesnt seem to set during the summers in Iceland. I’ve woken up and peeked outside at 3 am – and it was still lit up like twilight. When visiting geothermal areas like Seltun, Hverir or Gunnuhver, PLEASE stick to the marked paths. You can get a very bad burn from the scalding hot steam/water otherwise and hospitals are really far away from some of these places (and going by the jokes of the tourist guides, it happens far too often).